There’s nothing particularly rusty about this guy. He’s got a better-than-average singing voice (he’s even his own harmony section), he knows his way around the guitar (lead, pick and riddim) and his songs deal with love and unity and the Almighty – stuff that never ceases to matter. A native of Long Beach, CA, Rusty Zinn was raised on all sorts of music, becoming a respected bluesman before reggae took over as his primary passion. That passion is smartly manifested on Manifestation, which was recorded in Jamaica and San Francisco and proves to be the work of a skilled, confident artist whose blues roots are evident. Rusty also shows that he has a feel for pop hooks, conscious themes and reggae that’s got soul (check the Stax-like horns that set off the altruistic opening number “Give Something You’ve Got”). Half the album’s songs were Jamaican sessions with backing by elite players like Sly Dunbar on drums, Boris Gardiner on bass, Robbie Lyn handling keys, guitarist Mikey Chung and percussionist Scully Simms. But the Bay Area tracks are not lacking in roots quality either; therefore, the entire disc is one continuous flow of reggae and rocksteady goodness. Spiritual testimonies “My God,” “Heaven Is A Place Called Zion,” “For Creation” and “In Zion (There Is No Night)” are set to grooves as foundational as lovers’ rock sentiments “How Could I Let You Get Away” and “A Many Splendored Thing.” Zinn’s voice throughout rings with rich clarity that could do justice to any genre of music – it just so happens he had the good sense to choose reggae as his means of getting this set of positive messages across. 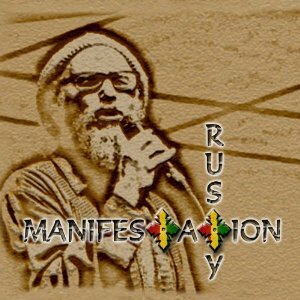 Manifestation is livicated to the memory of Alton Ellis, who is no doubt residing in the very same Zion that Zinn sings about and surely well pleased to have his name attached to such a very fine piece of work. Reggae on, Rusty.